When you score 50 goals in one season for any club at any level, you are going to be noticed for the achievement. 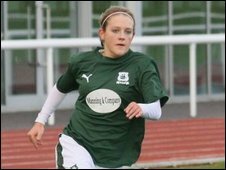 Messi has done it, Ronaldo has done it, but so has former Plymouth Argyle striker, Chloe Roberts, who found herself being offered a scholarship to play football in America at the University of North Alabama a few years ago. The 22-year-old has just come to the end of a four years stint at the southern state university, but she has certainly left her mark on the facility’s history books. Chloe is now deciding on the next step of her career after she was unfortunately overlooked in last week’s NWSL college draft. 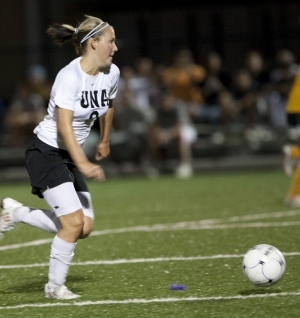 However, don’t think that the girl from the southwest has given up her dream of playing professionally – far from it. I caught up with her this week to find out what life in the U.S has been like, writing her name in the history books, and where next for the hotshot striker. Life in Alabama has been a life changing experience. Moving to the USA to play soccer and get an education was a dream of mine, so when I got offered a scholarship to attend The University of North Alabama, there was only one thing in my mind and that was to pursue my dream and love for the game. It is a lot different to my hometown Plymouth, but I feel it is has shaped me into a better person in many ways. Moving across the other-side of the world at 18 was not easy, but one I do not regret. I have met some incredible people here in Alabama over my four years, which has made my life here so enjoyable. 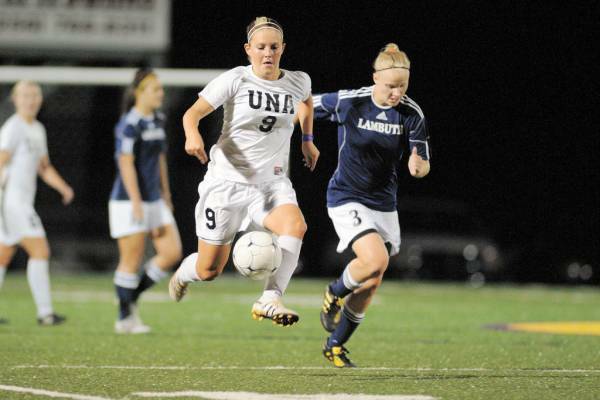 You finished as the college’s second all time scorer with 93 goals. That’s some return. How pleasing is it to have that written in the record books? Holding the record of 93 goals at the University of North Alabama is one I never thought I would achieve. I play for the love of the game. I just want to win. Goals, assists and records are bonuses. This is a record I am very proud to hold at this amazing University. It has been an honour to put on the jersey for the last four years. One main reason I was able to achieve this is due to my teammates I have played with. Every single teammate has had an impact on every goal I have scored, so I owe a huge thank you to each and every one of them! I don’t only need to thank my teammates, but everyone involved at The University of North Alabama for their amazing support. How has your game developed since moving to the States and do you ever wish you’d stayed in England? My game has developed in many ways. I feel by playing soccer day in day out, practicing and playing games, I have managed to develop technically and physically over the years, putting in the extra hard work to get better. I try and put myself in the best position to make an impact on the field with a never give up attitude. I don’t regret moving to America as I feel I have a lot to be proud of, and am very glad I followed this dream of mine. Its hard to look back and think what would have happened if I stayed in England, but I couldn’t have wished to achieve has much as I have here in America. What is it about scholarships in America that are so appealing? What appealed to me was the opportunity to pursue a life changing experience. Moving across the other side of the world appeals to a lot of people, especially to play a sport you love. Being offered a scholarship to help with schooling to get a degree, and to play soccer every single day is something that anyone would be hard to turn down. It gives an individual a sense of independence, an opportunity to meet new people and a chance to make your family proud. The NWSL draft took place last week and sadly, like a lot of players, you were not drafted. What now for you? Not being drafted was obviously a disappointment but it doesn’t mean I am giving up. I am very happy for all the individuals that did get drafted, and I wish them all the very best of luck in the new league as they deserve to be there. My dream is to become professional one day and I believe I can. I know it is hard for a team to take a chance on a division two player, but I do have a lot to offer. I will now sit and look at my options and go from there. I will continue to work hard every single day to put myself in the best possible position if an opportunity does arise. I feel I need someone to take a chance on me so I can at least prove what I have got and can give to a team. My love for the game is something that makes me never want to give up. Playing soccer day in day out is a perfect life for me and I will go to above and beyond to achieve it. Do you think this league can be sustainable? We’ve seen previous leagues in America collapse – so what makes this one different? I feel this league will be sustainable simply because of how everyone seems to be so excited and motivated to making this league work. I feel that it has to so that Women’s soccer can continue to grow here in America, and all over the world. What do you think the game in England could lean from that in the States? I don’t really know what England could learn from the USA. Every team and league is different and successful in its own way. I feel the English league is a great league to be a part of, just like any other league in the world. Who are your footballing heroes, male and female? Would you consider a move back to England to play in the WSL? I have many footballing heroes, both male and female in different ways. Too many to name, as i look up to many footballers to strive to be like them. I would consider a move back to England if going back home was the best option. Like I said I will continue to work hard and see what opportunities arise. I am not ruling out anything. In an interview you did for the BBC a few years ago, you mentioned you were involved with he England under-20s. Do you still have ambitions to represent your country? Representing your country is an honour. Of course that is still my ambition to play for them again. Maybe one day it will happen, I just have to keep working hard.